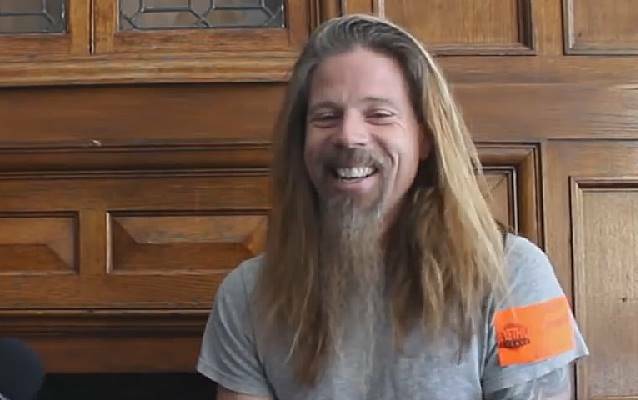 Drummer Chris Adler of Richmond, Virginia metallers LAMB OF GOD and director Don Argott were interviewed on the February 21-23 edition of Full Metal Jackie's nationally syndicated radio show. You can now listen to the chat using the Podbean widget below. LAMB OF GOD recently entered into a worldwide distribution deal with Specticast (LED ZEPPELIN's "Celebration Day", Paul McCartney's "Rock Show") for its Don Argott-directed ("Last Days Here", "Art Of The Steal", "School Of Rock") feature film "As The Palaces Burn". Filming for the movie began in 2012 and concluded in March of 2013. "As The Palaces Burn", which should not be confused with the making-of documentary packaged with the recent re-release of the 2003 LAMB OF GOD album of the same name, was conceived to be a documentary focused on the power of music and its impact on cultures around the world and its ability to bring together people of all nationalities regardless of religious or political differences. After a worldwide casting call, filming took place in Colombia, Venezuela, Israel, India, and the United States. As filming reached its conclusion, the documentary was forced to take a major turn when the band's lead singer, Randy Blythe, was arrested in the Czech Republic and charged with the murder of a fan in June 2012. Granted unique access to Blythe's saga, Argott's filming covered Blythe's 38-day imprisonment in Prague, his release and the band's return to live performances, and finally Blythe's trial for murder in Prague in February 2013.